Shooting stars, Weather, and Rocks falling from the Sky! What do shooting stars, weather and rocks falling from the sky have in common? Are you wondering whether we have gone mad asking such a question? Do rocks ever fall from the sky? Of course they do! You might know them better as “meteorites”, and they are meteors, or rocks from outer space, that fall down to the earth. And what does that have to do with weather? It’s not like they come down like rain! And before you say to yourself “meteor shower”, remember that a meteor is actually a shooting star, a space-rock that burns up in the Earth’s atmosphere. Related, yes, but weather, no. The weather connection is through another word, generally used to mean “study of the weather”. That word is “meteorology”. As you can see, all three have something in common – the word “meteor”. So what is this word, and how did it come to mean these different things? Meteor came into English through French in the late 15th century. In French it was meteore. Very similar, you might think. Does this mean that it is a French word. Not at all. The next question we must ask ourselves is where did French get it from? The answer is from Medieval Latin meteorum, which meant “things in the heavens”. But this is not the end of the tale. Latin took the word from ancient Greek, and in Greek we can analyse the word to see what it really means. The Greek word μετέωρα (meteora) can be broken into two parts: meta, which means “over, beyond” and aora, which comes from the verb αείρω/ αίρω (aeiro, airo), which meant “to raise, lift up”. Even today, in Modern Greek, αιωρείται (aioreitai) means “it hovers”. All this means that the original meaning of the word was “thing that is raised in the air”. And even in ancient times this developed to mean “things in the sky” and gradually came to have the meaning it does today. Another interesting point is that the word “air” is in fact from the same root as αείρω (aeiro), which makes it a distant cousin, or cognate, of “meteor”. 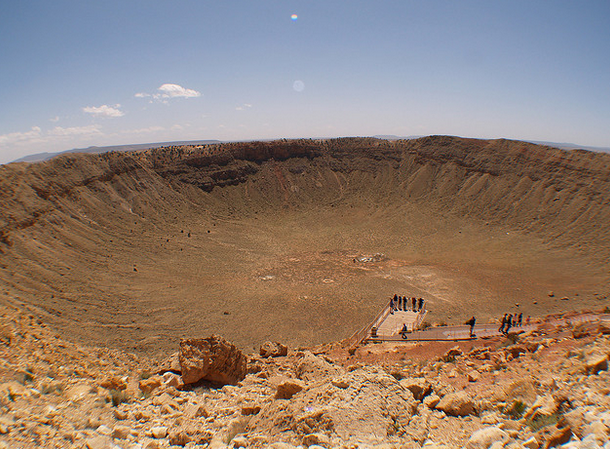 One of the largest and most famous meteor craters is to be found in northern Arizona, desert of the U.S. It is 1,200m wide, 170m deep and calculated to be created 50,000 years ago! It is more commonly known as the Barringer Crater. What is Your Favourite … Poem?